The ES10-101-PP demonstrates one of the many extended stem level sensing configurations available. This is a low cost way to get a custom single point switching depth for high or low level sensing in plastic or metal tanks. The 1/4" bulk head fitting and slosh shield protects the switch from wave motion and allows mounting through a hole in a bulk head up to 3/4" thick. 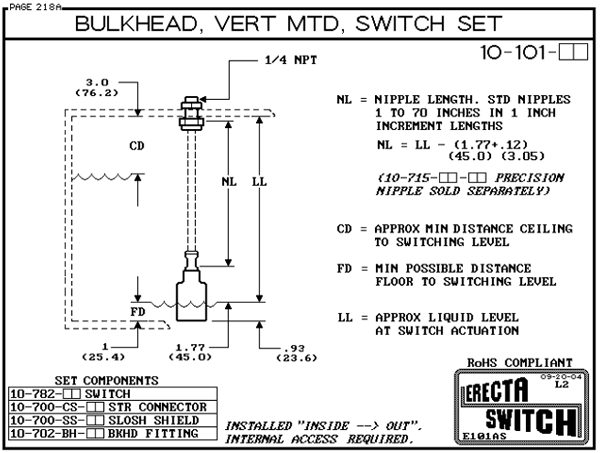 The ES10-101-PP is available for single point switching only. (Slosh shield is optional).